The large great room, kitchen, dining and master bedroom are located on the 3rd floor providing great views in every direction. The open floor plan extends into the elegant, great room with a 30 ft ceiling large dining table seats 10 people plus an adjacent breakfast area with sitting for 4. Well-equipped kitchen for all your cooking needs. The Master bedroom is on the main living area ( 3rd floor) and has a queen bed, sitting area and bath with large custom tiled shower, his and her vanities and a Jacuzzi with great ocean views. The 2nd floor has 4 bedroom consisting of 1 king bed ,2 queen beds and 2 twin beds, 2 baths, & a laundry room. This house is best suited families , reunions, business meetings and mature adults. Great location, ample space, and breathtaking views. What else could you need!? My team and I loved staying here and could not have asked for better hosts. We look forward to hopefully returning next year! The house was amazing and perfectly met the needs of the guests. There was plenty of space for all guests to sleep and the property was very convenient to beach access. We could have used the fridge in the garage for additional space, however, it was unplugged and did not seem to work. Some of the guests also said some showers only got to lukewarm temperatures, however, other showers did just fine. Overall, we loved the property and would definitely stay again in the future! The house was large enough for a big group and not be on top of each other. House was clean and the kitchen had everything you need to cook for a large group. The decks are fantastic. Having beach chairs and coolers at the house made packing easy. The only complaint was the outside refrigerator/freezer didn't keep things cold. Great house for a big group. The property manager was quick to respond. Will definitely stay there again! We are glad to hear you enjoyed the house! We look forward to having you return. Thank you very much for letting us know the refrigerator isn’t cooling. We will have it repaired or replaced ASAP! This is a great house for a big group or multiple families. 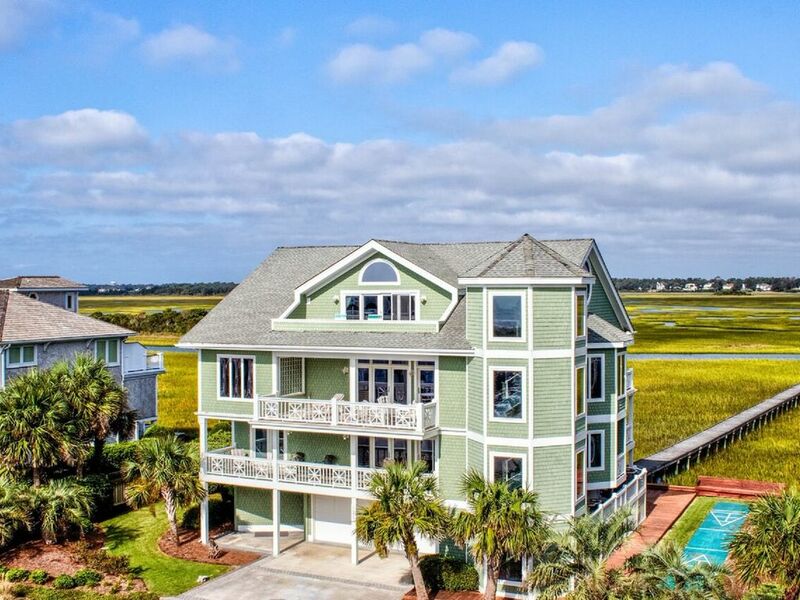 Lots of living space and great porches with views of the marsh and ocean. There are beach chairs, bikes and other games you can use on the beach, and there's an indoor pool and hot tub for the winter. Overall, our stay was really nice and enjoyable. I will definitely look into this renting this house again! We rented the house for my daughter’s graduation from UNC Wilmington. It was perfect for our large group. We enjoyed Kayaking on the Sound and spending time on the beach. Wish we had more time to enjoy the amenities in the house. Great location! 1. Water cooler was not even halfway full when we arrived. There is a note by the cooler telling guests this is one of the amenities of the house, however there was barely any in the container. 2. Maid’s closet was open with light on when we arrived in the master bedroom. It had a lock on it so it seems like the crew was in a hurry and didn’t close it up. 3. Property manager gave us the wrong code to the house, so when we arrived we couldnt get in. She was reachable and resolved the issue. 4. Not enough towels for everyone, so we emailed property manager who said she would come by and bring more; she never came. 5. Sink in master bathroom was broken and wouldn’t empty. Property manager also said she would come look at this and never did. 6. There was a sign from owners that welcomed us to the house and several reviewers said a bottle of chamapagne or wine was provided upon arrival but we didn’t have that. House did what we needed it to do, but it is definitely outdated. Unfortunately, we can't change the 5 gallon water jug until it is completely empty. However, we did leave out a new one for when the half empty one ran out. We do leave out a bottle of wine for our guests for special occasions. I apologize but we were not informed of any special occasion for your stay. The cleaning crew came by to lock the cabinet and to walk through the house making sure everything was ready for your arrival, when they pulled up to the house your guests had arrived 2 hours early. They did not want to disturb you so they left. The property manager had tried to reach you several times to let you know she was coming by. She did not want to come in unannounced. We are so sorry for any inconvenience this may have caused during your stay.